'We Hurt A Lot Of People,' Westboro Pastor's Granddaughter Says : The Two-Way Nearly a year after breaking with the Westboro Baptist Church, two of Pastor Fred Phelps' granddaughters are enjoying a new freedom. But as they tell a Canadian newspaper, they also want to extend empathy to those they hurt in the name of a cause championed by the man they call "Gramps." 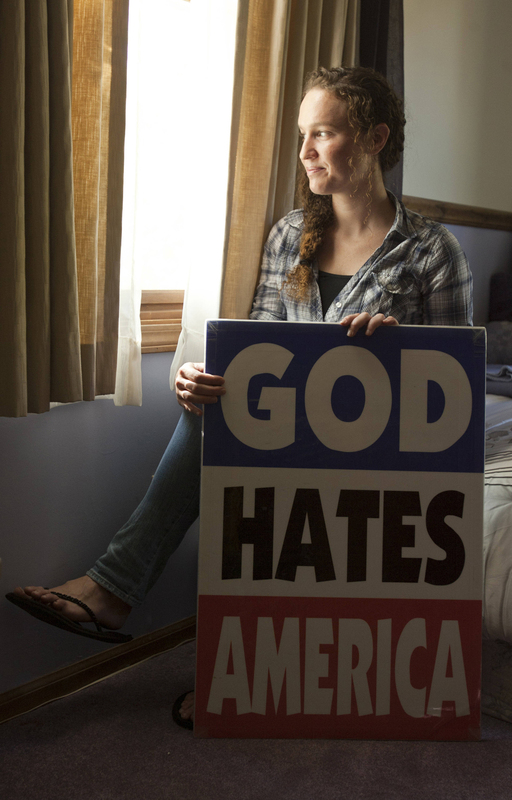 Megan Phelps-Roper, granddaughter of Westboro Baptist Church leader Fred Phelps, is seen during her days with the church. Now alienated from their family, Phelps-Roper and her sister, Grace, speak to religious and cultural groups. Nearly a year after breaking with the Westboro Baptist Church, two of Pastor Fred Phelps' granddaughters are enjoying a new freedom. But as they tell a Canadian newspaper, they also want to extend empathy to those they hurt in the name of a cause championed by the man they call "Gramps." Those are among the details that emerge in an interview in The Globe and Mail conducted in Montreal, where Megan and Grace Phelps-Roper are spending a month at the invitation of a Jewish community. In a turnaround from their years in a church known for its fierce protests at the funerals of American soldiers and others in the name of denouncing homosexuality, the women often speak to community and educational groups about tolerance and religion. That means Megan, 27, and Grace, 20, are living much of their life on the road. "We don't have a set home," Megan says. Discussing her future goals, Megan tells the newspaper, "I'm at a complete loss. But I do know that I want to do good, to have empathy. Even though we intended to do good [with the picketing], we hurt a lot of people." Like many Westboro Church members, they had been living just down the road from the church in Topeka, Kan. And they say they understand the certainty its members show in stating their beliefs — even though they no longer agree with them. "The way the church presents it is, there's the WBC and the rest of the world. And the rest of the world is evil. The WBC is the only place in the world in our generation that is telling the truth of God," Megan says. Over time, those little things built up, and there were so many of them. Once you step out of it for a second, and you're out of that vacuum, things change." The sisters also say that it was very hard to leave their parents and siblings. Before their departure, it was made clear to them that leaving the church would be the same as leaving the family. "We were both terrified after leaving," Megan says. "I was afraid we were going to hell. Many times when we were driving, I thought God was going to kill us." "I won't get to hear my brothers playing piano again or see my parents' hair go gray," Grace says. A driving factor in their departure was a series of email and Twitter exchanges between Megan, who ran the church's social media efforts, and David Abitbol, the editor of the Jewlicious blog, who repeatedly challenged the church's stance on Jews. They eventually met in person. 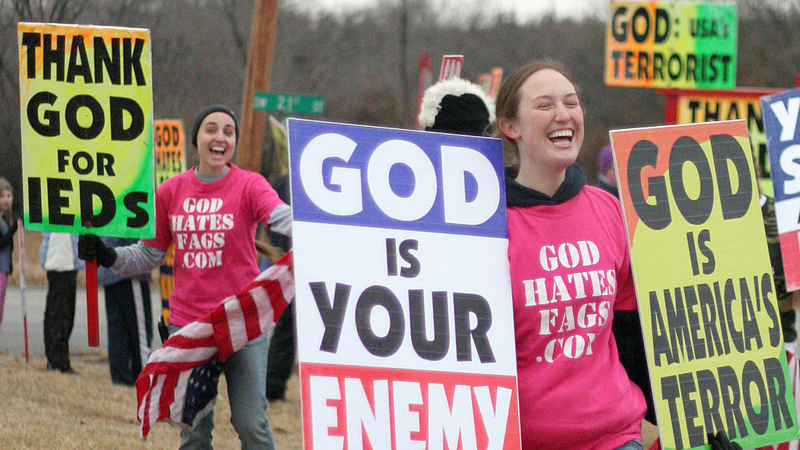 Westboro Baptist Church members hold a protest in Topeka, Kan., in this photo from the Showtime documentary Fall From Grace. "Say what you will about the Westboro Baptist Church, but they raised a couple of really, really nice girls," Abitbol told The Daily Beast in March. "They are wonderful guests, super polite and super friendly. And here's my revelation: had Grandpa Phelps been my grandpa, I would have been no different. What makes Grace and Megan so remarkable is that I don't know, if I'd been in the situation they had been, that I would have had the strength of character and intellectual integrity to walk away from my family." Abitbol was speaking as the two sisters attended a Jewlicious festival in California; he helped facilitate their current trip to Canada, as well. Their story details how two young church members who had once spoken out against other religions eventually came to visit a different church — with a gay man and his husband. That man is Jeff Chu, who had interviewed Westboro members in writing his book about being a gay Christian, Does Jesus Really Love Me? About a year after that visit, Megan called him up to say she'd left the church, he says. "Megan was really one of the strongest voices in the third generation of the Phelps family," Chu tells The Globe and Mail. "They were both junior, but key members of the WBC. They visited and my husband and I went to church with them — something I never thought would happen." As for their long-range plans, the sisters say they've been offered chances to capitalize on their background — including a pitch for a reality TV show. "We do not want to use our past as a way to make money. We abhor the idea," Megan says.